If you’re running a high tech CO2 tank, this means you already have pressurised gas. Your choice so far has been excellent because the merits of running CO2 far outweigh the negatives, particularly if you are after lushous plant growth. Plants really need CO2 in order to flourish. But not everyone who runs CO2 actually has a solenoid valve.This always puzzles me because of the amount of gas wasted in money could easily be retrieved by investing in a solenoid. So why waste it? Some hobbyists will run it 24/7 to avoid certain plants from melting like crytps but I’ve never encountered these sort of problems and as a result can’t see the reasoning for it. In addition running CO2 all day and all night can cause fish severe problems if your plants are not producing enough O2 during daylight hours. The excess CO2 can make your fish suffocate (I have seen this before). How to fit: A solenoid valve fits inline so the set up would be simple if you were considering improving your system. CO2 tubing which currently comes from your regulator would fit into your new solenoid and be secured safely. Then, attach a new piece of tubing to the opposite side of your solenoid attach a non return valve and then further down the line, your CO2 diffuser. The solenoid has a plug attached to that and when the power is on, gas is allowed to freely pass through the solenoid and when it’s turned off (at night) the valve shuts and gas cannot pass though (therefore saving your fish and saving wasted gas). That’s all there is to it. A very simple and effective improvement to any existing CO2 system. We have a wide range of solenoids on the website. I thought I would touch upon a post that one of our contributors Luis made when he wrote about heaters for planted aquariums. They’re an essential price of equipment and something that you really need to rely on too. After investing in a lot of your hard earned cash on aquatic plants and fish the last thing you want is your heater to let you down. So first you have to invest in a quality heater. That’s easy and this particular blog is about the Hydor External Heater – a quality Italian product made with a patent that is brilliant. 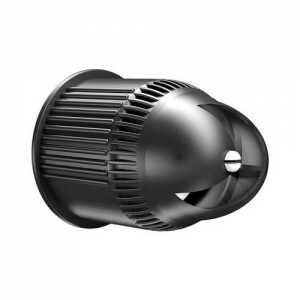 The Hydor External Heaters as you’ve probably guessed sits on your external piping so after the water has passed through the filter, it then runs through the heater and back into your aquarium (see image below). They’re not the smallest heater in the world by any stretch at approximately 30cm x 6cm x 8cm but they are the only external heater that I have ever seen. With Nature Aquariums, keeping as much equipment out of the tank is the goal and this products is perfect in that respect. Years ago, heaters were always on the inside and you had to try and hide them behind plants or other equipment but no longer is this the case. You can fit your heater anywhere on the outflow pipe of your external filter piping. When fitting it, try and keep it in your carbinet – this ensures everything looks neat and tidy and also if you ever spilt water from your aquarium, it wouldn’t get wet. So it all sounds pretty good right? What’s the catch? Well there’s not really any catch. They do need to be kept at a minimum angle of 45 degrees due to the heating element inside (which is where the secret lies). If you try and run the heater at 90 degrees the unit will over heat and then stop working – this is where stories on the internet have popped up and hobbyists have kept them lying down. If you keep it at a minimum of 45 degree you won’t have an issue. Ideally you want it vertical – this is the best way to heat your water up as it stays in contact with the heating element for longer and therefore keeps your water at a more stable temperature. The Hydor External Heaters are the most accurate out of all heaters on the market. You can set the temperature to half a degrees accuracy. Perfect for anyone who specifically wants a certain temperature. There are three models available today. 12mm 200w, 12mm 300w, 16mm 300w. All operate in the same way and dimension wise almost the same. If you have found this post useful, perhaps you could tweet this post or maybe share it on Facebook. And if you have any questions, just hit the reply button.